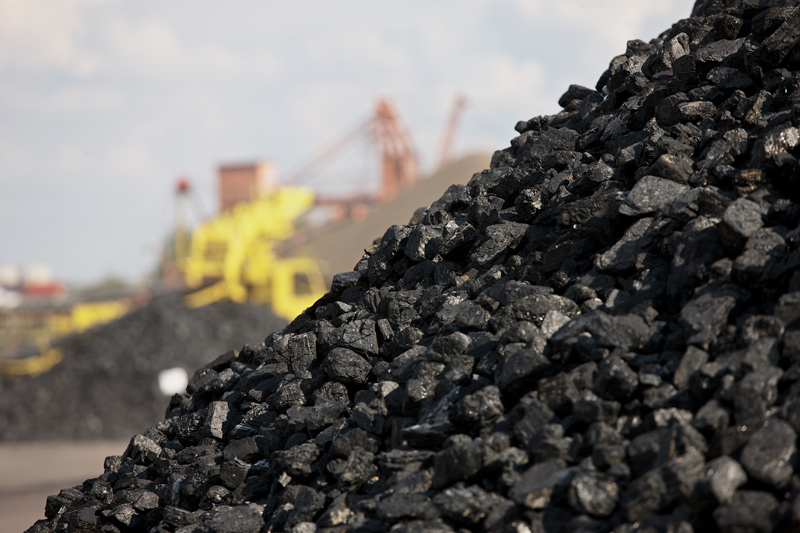 The latest annual report from the International Energy Agency (IEA) shows the coal market under intense pressure, reflecting Chinese economic restructuring and global environmental policies. Following more than a decade of aggressive growth, global coal demand has stalled, the IEA has concluded in its annual coal market report. The report sharply lowers its five-year global coal demand growth forecast in reflection of economic restructuring in China, which represents around half of global coal consumption. Greater policy support for renewable energy and energy efficiency – the foundation of the COP21 agreement in Paris – is also expected to dent coal demand. The IEA's Medium-Term Coal Market Report 2015 has slashed its five-year estimate of global coal demand growth by more than 500 million tonnes of coal equivalent (Mtce) in recognition of the tremendous pressures facing coal markets. This revision comes as official preliminary data indicate that a decline in Chinese coal demand occurred in 2014 and is set to accelerate in 2015. A decline in coal consumption in China for two consecutive years would be the first since 1982. "The coal industry is facing huge pressures, and the main reason is China – but it is not the only reason," IEA Executive Director Fatih Birol said as he launched the report in Singapore at an event organised by the Energy Market Authority. "The economic transformation in China and environmental policies worldwide – including the recent climate agreement in Paris – will likely continue to constrain global coal demand." Strong growth in coal use in India & Southeast Asia offset declines in the EU & the US, but does not match the rise seen over last decade in China. Coal demand in China is sputtering as the Chinese economy gradually shifts to one based more on services, and less on energy-intensive industries. New Chinese hydro, nuclear, wind and solar are also significantly curtailing coal power generation, driven not only by energy security and climate concerns but also by efforts to reduce local pollution. Given the strong rebalancing of China's economy, the report also presents an alternate scenario in which Chinese coal demand has already peaked. In this so-called "peak coal scenario", infrastructure and energy-intensive industries represent a lower share of Chinese GDP than in the report's base case, while services and high-tech manufacturing gain momentum. In the peak case, Chinese coal demand in 2020 is 9.8% percent below the level in 2013 and more than 300 Mtce below the base-case forecast of nearly 2950 Mtce in 2020. 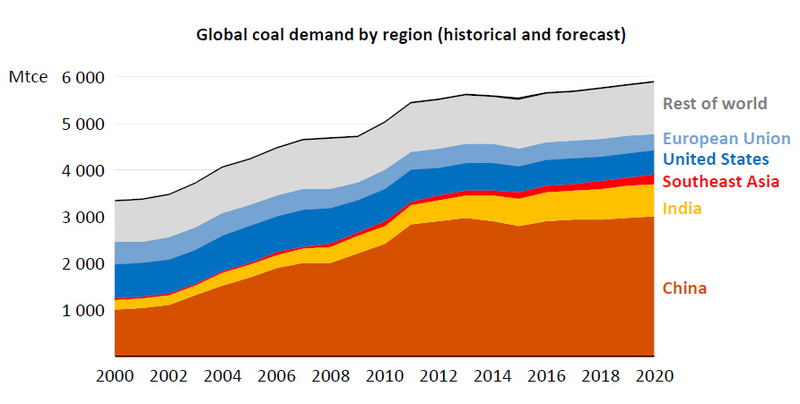 Meanwhile, global coal demand in the peak case drops to around 5500 Mtce in 2020 – falling 0.1% per year on average, compared with growth of 0.8% per year in the report's main forecast. The report sees coal demand outside China modestly increasing through 2020 as the structural decline in Europe and the United States is more than offset by growth in India and Southeast Asia. The Indian government's push for universal energy access and an expansion of manufacturing will drive electricity growth. In addition to India's ambitious renewable targets (175 GW of renewables by 2022, of which 100 GW are solar PV), coal will provide a significant share of additional power requirements – as much as 60% through 2020. Indeed, preliminary data show India overtaking China as the world's largest coal importer this year. The region with the highest growth rate in coal use in the outlook period is in Southeast Asia, where Indonesia, Vietnam, Malaysia and the Philippines among others plan to underpin their power generation with new coal power plants. Unfortunately, around half of the new coal-fired generation capacity under development in the region still uses inefficient subcritical technologies. Slowing economic growth and energy consumption in China as well as the restriction of coal use in its coastal regions will impact seaborne trade, especially Indonesian exports. 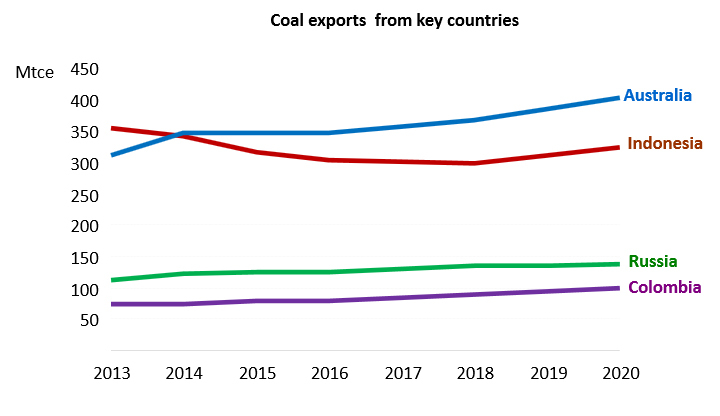 In the IEA report's forecast, Australia takes a growing share of seaborne coal trade. The four largest exporters represent more than 80% of seaborne coal trade; India overtakes China to become the world's largest importer. Prices continue to remain at low levels. In December 2015, prices of imported coal in Europe fell below USD 50/tonne – levels not seen in a decade. Persistent oversupply and shrinking imports in China and elsewhere suggest prices will remain under pressure through 2020. With the recent COP21 agreement in Paris calling for the global increase in temperatures to be limited to "well below" 2 degrees Celsius, the IEA reiterated that carbon capture and storage (CCS) technology will be essential for enabling future use of coal without large CO2 emissions. "Governments and industry must increase their focus on this technology if they are serious about long-term climate goals," said Fatih Birol. "CCS is not just a coal technology. It is not a technology just for power generation. It is an emissions reduction technology that will need to be widely deployed to achieve our low-carbon future."